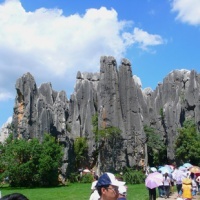 Located in the Shilin (Stone Forest) County, the Stone Forest Park is 78 away from Kunming. It covers an area of 350 square kilometers and known of its unique aesthetic peaks, grotesque rocks, strange caves, flying-down cascades, mountain lakes and the ethnic culture and customs. 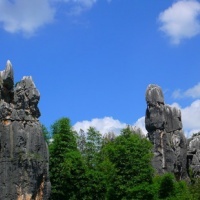 The Stone Forest Park has been one of the four natural wonders of China when it was first built in 1931. 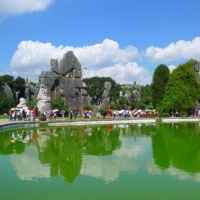 This topographical park featured the quintessential karst landform, it leave every tourist lost in wonders of stone swords, mushrooms, pagodas, pillars, castles, teeth, stalagmites, wealds, man and animals... they are so vivid and beautiful that any one is astonished at such a "natural museum of molding landform". 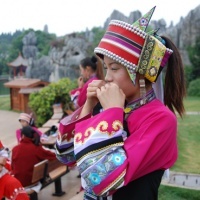 In addition to the natural wonders of the park, there are also a number of cultural and ethnic attractions which will greatly increase your enjoyment of the tour as well as gain your knowledge of the Chinese southwestern minorities. 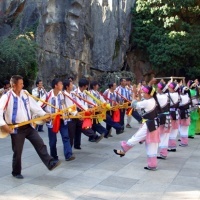 Some of the main attractions of the Stone Forest Park include: the old legends of "Ashima", the beautiful embroidery of Sani people, the "Torchlight Festival" of the Sani people on every June 24, and the warm and lively Yi nationality dance "Axi Dance under Moonlight" etc. Once you visit this park, your experience will not be forgotten. 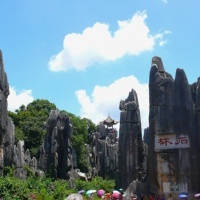 In short, the Stone Forest Park is an optimum destination to see the astounding landscape as well as the colorful ethnic culture and old folklore of Yunnan. Note: "Ashima" means a girl is as beautiful as the gold in the language of Yi nationality.